The title about says it all. 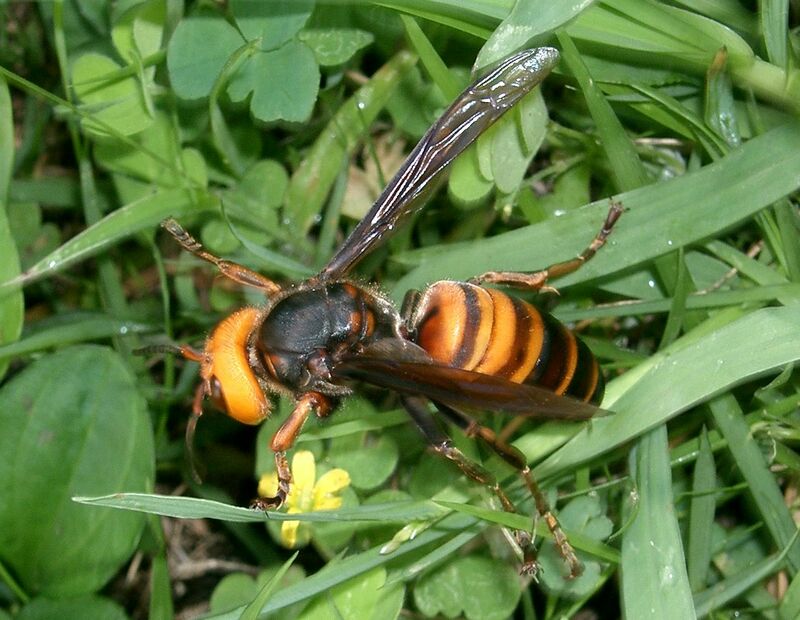 Asian giant hornets (Vespa mandarinia) are pretty terrifying – they’re the largest hornets in the world, reaching around 5 cm (2 inches) in length, or about the size of a person’s thumb. And they can kill a person if they get stung enough. They live in parts of Asia and are most common in rural Japan, where they’re known as the “giant sparrow bee,” but right now it’s in China that they’re causing the most problems. Since July in China, more than 1,600 people have been injured, and 42 killed, by being stung by the enormous hornets (and some smaller types). It’s thought that a recent heat wave is part of the issue – colder weather should hopefully push the giants into hibernation soon. Other than their sheer massive size, what’s most fascinating and horrifying about the giant hornets is their sting. Not only is their stinger quite large (about 6 mm, or 0.25 inches in length), but the venom they inject with it contains several chemicals that work in different ways to damage the recipient. Some of these chemicals basically dissolve tissue. For example, one is a phospholipase, which means that it breaks down and destroys cell membranes. And without a cell membrane, a cell cannot do much – it falls apart and dissolves. (Another chemical in the venom, specifically called mastoparan, works by stimulating phospholipase activity, so it pretty much does the same thing but indirectly.) So when someone is stung by an Asian giant hornet, the excruciatingly painful sting leaves behind a small hole of dissolved skin. And to make matters worse, a single hornet can sting multiple times (unlike bees and some other wasps, which have barbed stingers that prevent them from pulling it out). And it actually gets even worse than that – the hornets can release chemicals that attract other hornets, so a person can be targeted by an entire hive, which can chase that person at speeds up to 25 mph. If a person is stung five times, depending on their reaction (some people are allergic) they can die due to kidney failure. In China right now they’re recommending people to seek medical attention if they’re stung more than 10 times. This may seem like a lot of stings, but a single nest is often large enough to have over 1,000 hornets, and just in the last week more than some 4,000 nests like this have been destroyed in China. Clearly there’s reason to be on the lookout for things flying around outside, and for camouflaged nests that one might stumble upon. As a side note, while these hornets don’t have any natural predators, they are actually frequently eaten as a regular food source by people who live near them. So while people are working hard to destroy the hornets and their nests, at least the hornets themselves may be put to some good nutritional use.